An active farm that just happens to have hiking trails. This made for a great combination of sights, sounds, and some rather great photography opportunities. 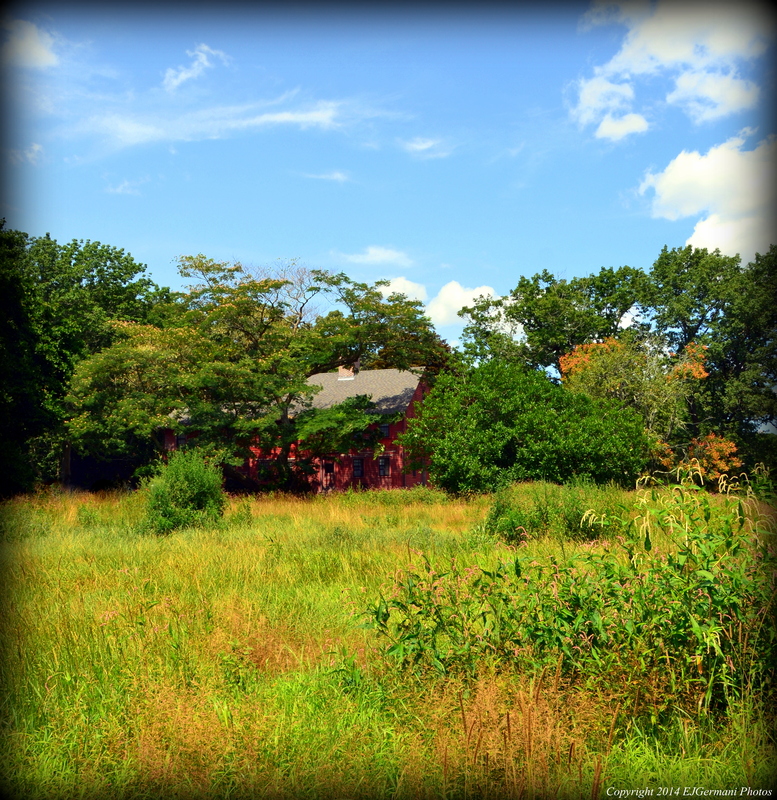 The property itself is owned by the East Greenwich Land Trust and the grounds are used by a community supported agriculture (CSA) program. I started this hike from the dirt parking lot just off of South Road. 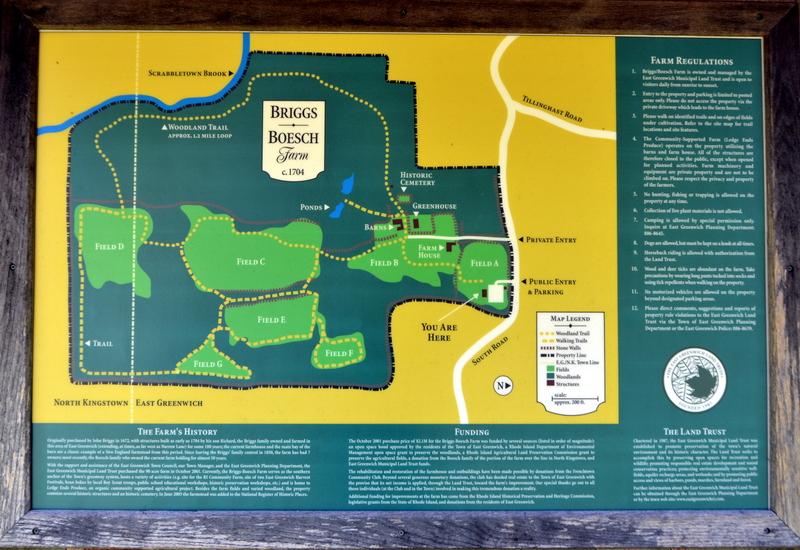 Here there is a large sign with information about the property and a trail map. Just to the left of the sign is a path that leads through an area of tall grass to a stone wall. The sounds of crickets were quite abundant here. After crossing the stone wall I was greeted by several chickens before the path turned right and toward the farm buildings. To the right over a field was the old farmhouse, in the barn on the left is Pat’s Pastured Farm Store. After being greeted (somewhat) by the farm dog I then made my way to the actual trail head just behind the barn. There is a small stone wall enclosed family cemetery here at the trail head. Some of the graves are those of the Briggs family dating back to the mid nineteenth century. Continuing along the trail I then came across some ruins of what might of been some sort of storage facility. I then continued to follow the trail as it came out to a dirt road. I followed the dirt road to the next intersection. Although the trails are not blazed, at each intersection there is signage showing the direction of the trail to follow. On this stretch, called the Woodland Trail, I came across some deer and some several toads crossing the path. At the intersection the sign instructs you to go left, as I did, after first exploring the road ahead to a bridge that crosses the Scrabbletown Brook. I then continued along the trail that was marked with the sign. This trail winds through the woods eventually coming to a field. The field is fenced in and trails follow the edge of the fence. The Woodland Trail continues to the right and this is the one I opted to take, keeping the fence to my left and the woods to my right. The trail turns left following the fence before heading back into the woods. You are actually in North Kingstown at this point. This part of the trail follows the southern border of the property with a stone wall to the right. The trail then turns left and comes to another field. Just after leaving the woods I turned left following the edge of the field, then back onto a dirt road into a wooded area to a four way intersection. 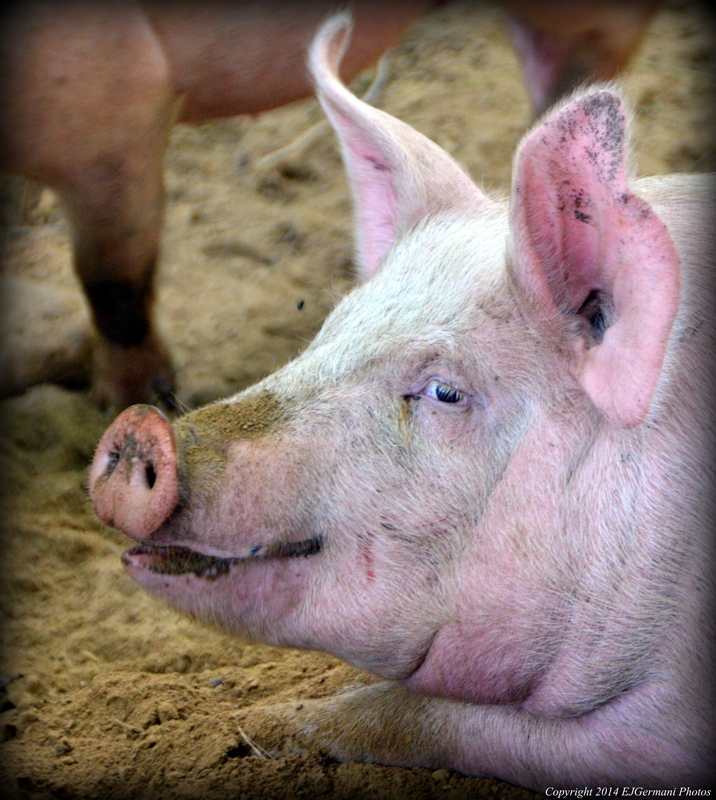 Here I turned right and started hearing the sounds of pigs. Along this stretch is a large area where the pigs are feeding and roaming around. They seemed very interested in my presence. After taking a few photos I then continued following the road to the left into another field before turning right onto the next road. This road led me back to the farm buildings. From here I retraced my steps back to the parking area. Aside from the farm animals and wildlife I also saw several types of birds here. This walk is dog-friendly, however, dogs must be leashed as not to disturb the farm animals. I did not find a trail map on-line, however I took a picture of the one at the entrance (see below).